Vynalez Zkasy (released in the U.S. as The Fabulous World of Jules Verne) may represent Czech FX pioneer Karel Zeman’s quest to emulate the style of 19th century fantasy illustration—to the end of presenting the future through a Victorian lens—at its most extreme. That does not mean that it is any less fascinating than, nor nearly enchanting as, films like The Stolen Airship and Cesta do Praveku/Journey to the Beginning of Time. It only means that there is a vague miasma of obsession that threads through the movie’s general air of wonderment. 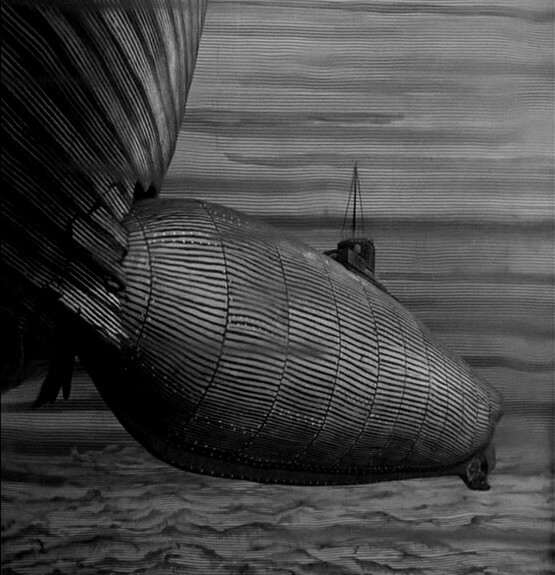 Like The Stolen Airship, Vynalez Zkasy is based primarily on one of Jules Verne’s novels (in this case 1896’s Facing the Flag) while liberally borrowing elements from another (in this case, most noticeably, 20,000 Leagues Under the Sea). The story is narrated by Simon Hart (Lubor Tokos), the dashing young assistant to Professor Roch (Arnost Navratil), who, at the film’s opening, is confined to an insane asylum. 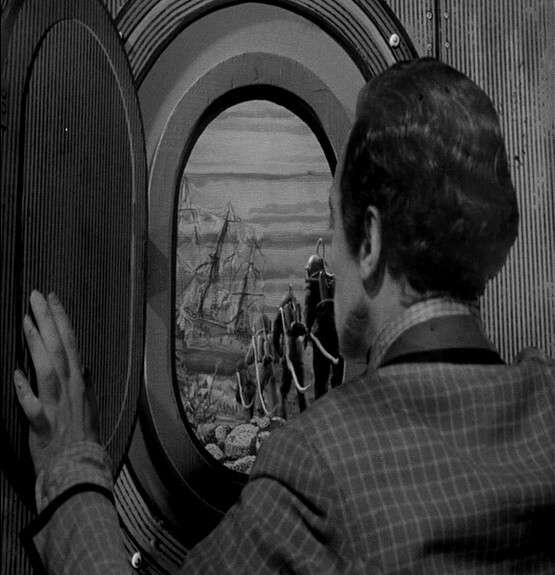 It is during a dark and stormy night’s visit to that asylum that both Roch and Hart are kidnapped by a band of pirates lead by Captain Spade (Frantisek Slegr). Spade is in turn acting on orders from Count Artigas (Miloslav Holub), a wealthy scoundrel. You see, Roch’s current work has seen him unlock “the secrets of matter”, a discovery which he sees as only to the benefit of mankind, while Artigas sees its potential for providing the destructive power of a humongous gun which he will use to make the leaders of the free world wet themselves in fear. Spade and his men herd Roch and Hart aboard their schooner and sets sail for Artigas’ hideout, which we eventually learn is housed, Blofeld-style, within a dormant volcano. On the way, they use a stolen submarine to ram unsuspecting merchant and passenger ships and rob them of their treasure. 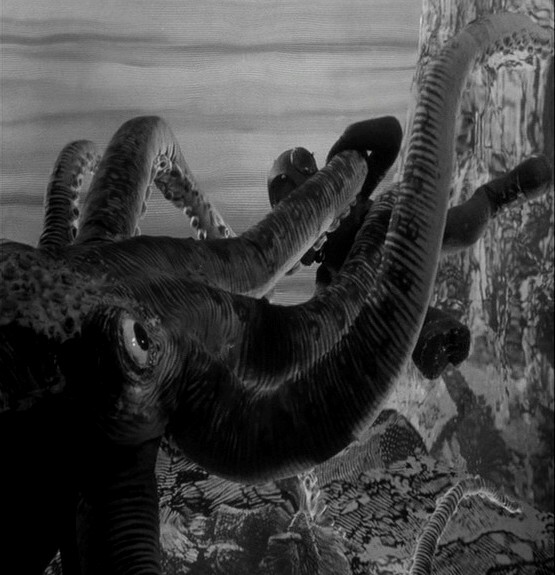 The scene of the pirates donning deep-sea diving gear and trudging across the ocean floor to pillage the hold of a sunken vessel provides the impetus for some delightful puppet animation, very reminiscent of the moon walking scenes in the Soviet silent Cosmic Journey. 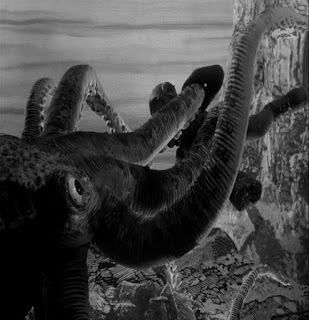 Zeman even throws in a fight with a giant octopus for good measure. In the aftermath of one of their attacks, the pirates take aboard a comely female survivor, Jana (Jana Zatloukalova), whose obligatory role in Vynalez Zkasy is underscored by just how little she is given to do throughout the rest of the film. Once arrived at the hideout, Roch is quickly seduced into aiding Artigas in building his super gun, at which point Hart, no longer of use, is banished to a rundown shack on the outskirts of the villain’s high tech manufacturing facility—which begs the question of how a sharecropper’s cabin ended up inside a volcano. 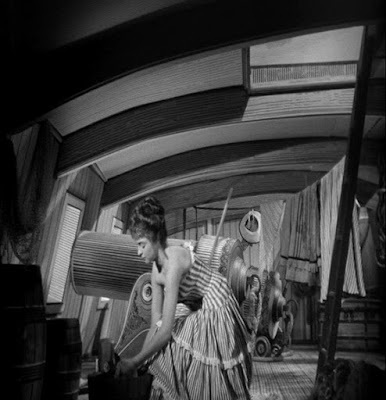 As for Jana, she immediately busies herself with tidying up around the place and, from that point on, is not seen without being in the midst of one of the many domestic chores that come up when one is confined within a cyclopean high-tech lair. Being a guy, Hart doesn't bother to clean his hovel and instead tasks himself with finding a way to foil Artigas’ plan--while, of course, taking time out to put some gentlemanly moves on Jana. Eventually, he ties a note to a weather balloon and sets it assail. Normally, we would see this as a poignantly futile gesture, so destined to fail that no further mention need be made of it. 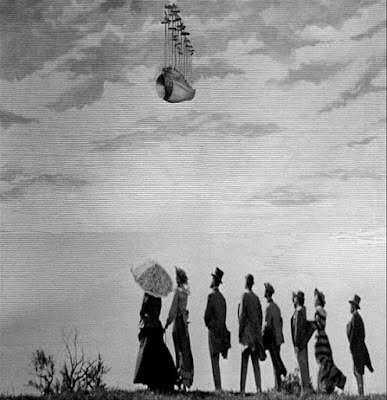 But then we consider that this is a film set in a Jules Verne universe, in which Victorian gentlemen in bowler hats happily traverse the skies in pedal-powered airships, and so it should be no surprise when the balloon, with note attached, quickly lands in the hands of the British Military. 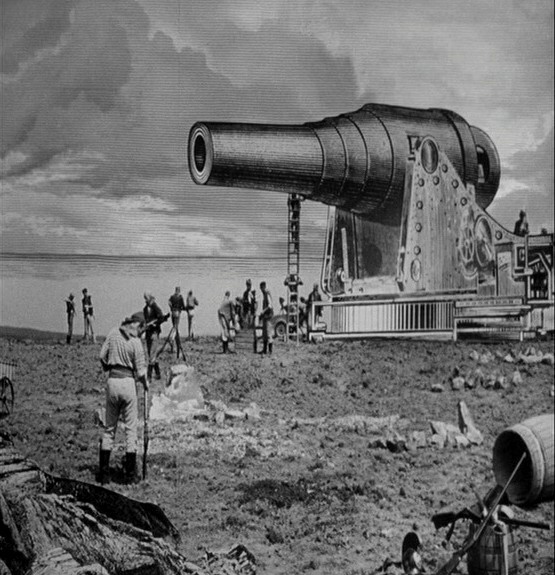 An attack is planned, of which Artigas is quickly notified, and the rest of the movie plays out as a race against time with Hart and his allies rushing to dismantle the gun before the forces of order arrive. 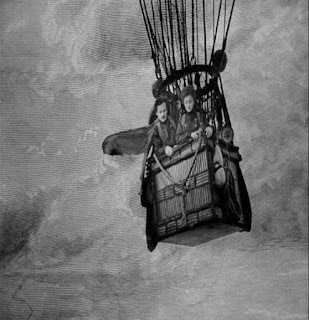 With its stylish interpretation of what is basically a boy’s adventure yarn set amid an anachronistically tricked-out turn-of-the-century, Vynalez Zkasy couldn’t help but remind me of Aleksandr Gintsburg’s The Hyperboloid of Engineer Garin. 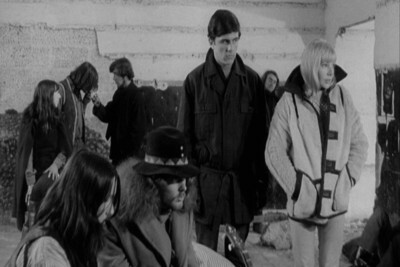 However, while I enjoyed Vynalez Zkasy a lot, I have to say that I enjoyed Gintsburg’s film more. That is because, amid its visual dazzle, Garin is anchored by the sterling performance of Evgeni Evstigneez in its title role. The performances in Vynalez Zkasy, by contrast, are generally competent but flat (reportedly at Zeman’s instruction), which leaves the performers constantly at risk of being upstaged by all the visual sorcery that surrounds them. Also working against them are all of the fetishistically ornate sets and background mattes (Zeman went so far as to paint costumes and set elements with striped rollers to emulate the unique crosshatching used by Verne illustrator Jules Ferat) in which they are placed, which threaten to render them little more than minor design elements. While echoing certain generic elements of Engineer Garin, Vynalez Zkasy also shares with it the creeping nuclear dread of its era, which was perhaps inevitable. This stands at odds somewhat with Zeman’s normally whimsical tone. Nonetheless, the film retains a certain, inimitable integrity. 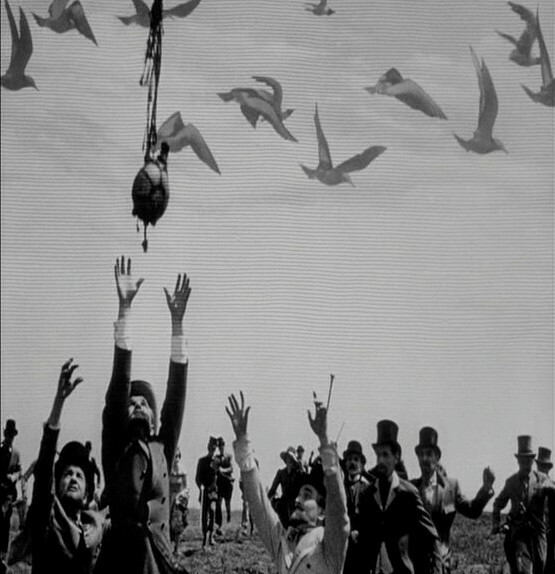 That is because it is a document of a very specific and deeply personal aesthetic, one that Zeman struggled so hard to keep consistent that he frequently employs animations using photographic cut-outs of his actors for matching shots. If, in this case, that aesthetic becomes a bit claustrophobic in practice, that is to be begrudgingly forgiven. Suffering their occasional indulgences is the price we pay for having artists of such unique vision in the world. If you want to learn more about Karel Zeman, please see my friend and colleague Keith Allison’s fantastic overview of his career over at Teleport City. 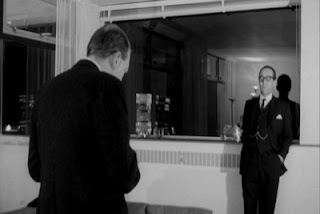 I mentioned in an earlier post how, as a child of the early 60s, my budding conception of adulthood and what it meant to be a "man" were largely informed by spy movies. This was so much the case that I could not picture myself as an adult without seeing myself in a crisp black suit with a cocktail glass in one hand and a beautiful woman on my arm. In the current era, the idea of their child turning to such suave sociopaths--with all their casual misogyny and xenophobia--as role models would likely send most well meaning helicopter parents whirling out of their Birkenstocks. Indeed, it's a wonder that I didn't grow up to be an insufferable boor. I think it helped that foremost among my pantheon of secret agent idols was John Steed. 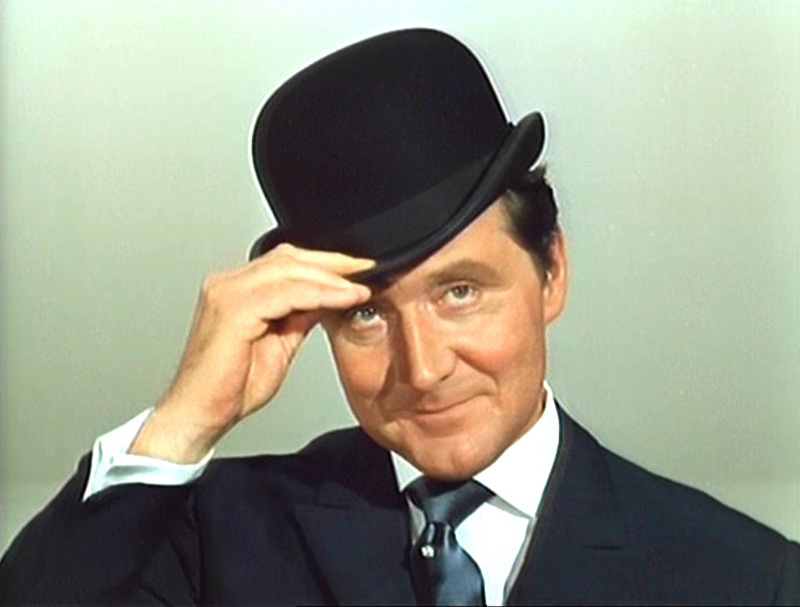 Genteel, keen of wit, and shy of the gun, Steed also had the good fortune to be played by Patrick Macnee, who granted him a seasoned maturity that made him pop culture's coolest middle-aged man--while also giving him the winking good humor of a favorite uncle. Still, as a kid growing up in a house full of strong women, I think for me Steed's greatest attribute was that he could make of a woman as brilliant and mighty as Emma Peel a trusted friend and respected colleague. For me, it is the profound depth of their partnership, their mutual admiration and regard, that makes Steed and Peel one of the greatest of all male-female screen pairings, and Patrick Macnee's John Steed a truly modern masculine archetype. I'll be honest. Though I will sometimes eulogize them, I don't usually get too choked about celebrities dying. Though, in the case of Patrick Macnee, who died earlier today, I have to admit to feeling a little ache, a sense of something in the world being lost. It is also possible that what I'm feeling is a sense of a debt being owed. 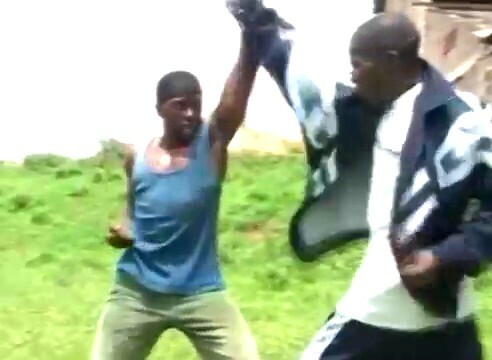 I feel that, despite some questionable influences along the way, I've done alright with this whole being a man thing; I can not only love a woman, but also like her; I respect the dignity of others, place a high value on the virtues of civility and kindness, and change my underwear on a strict schedule. For this I feel I should thank Patrick Macnee. He staked a claim on my imagination at a very young age, and so deserves some credit for making me the man I have become. With their prim matching suits and young Republican haircuts, the Dave Clark Five visually slotted right in with Mersey Beat also-rans like Gerry and the Pacemakers and Freddy and the Dreamers. However, listening to hits such as “Glad All Over”, “Bits and Pieces”, and “Any Way You Want it” reveals that they were much closer musical kin to American garage rockers like the Sonics and Paul Revere & The Raiders. These tracks barrel through the room like a freight train; guitars, drums, saxophone, and organ all blaring in unison as if trying to drown one another out, without a moment’s pause or concession to dynamics. Suffice it to say that they were offering something very different from the Beatles, which is perhaps why, for one heartbreakingly brief moment in the mid-sixties, they were the most credible challengers to the four lads from Liverpool’s chart topping hegemony. 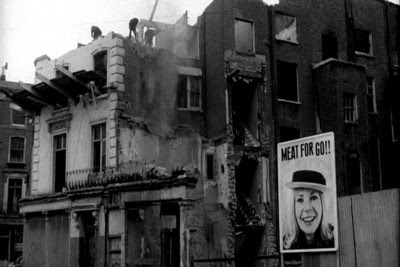 Such was the status of the DC5 circa 1965 that it was all but inevitable that they would star in a feature film, as did seemingly every other British pop band of the period. This might not have been the case if not for the release the previous year of A Hard Day’s Night (which you have perhaps heard of). Of course, with the Beatles, it was pretty much guaranteed that any film starring them at that time would be successful—so much so that the film could have been just 90 minutes of them peeling potatoes and would still at least break even. 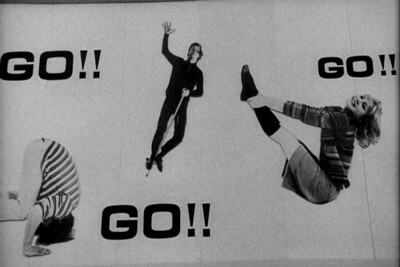 Director Richard Lester used the leeway this afforded him to experiment, creating something that combined documentary-style shooting, Goon Show inspired absurdist humor, and performance footage into something unlike anything audiences had seen before. Producer David Deutsch likewise insured that Having a Wild Weekend (released in the U.S. as Catch Us if You Can) would be far from a run-of-the-mill rock and roll film by assigning it to a young TV documentarian named John Boorman, for whom the film would be his first theatrical feature. 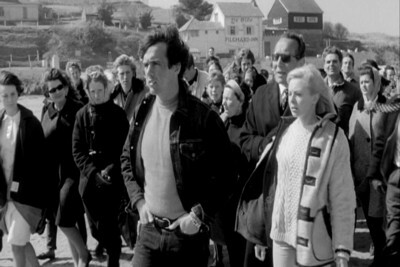 Having taken the first step of including the members of the Dave Clark Five in the film, Boorman and screenwriter Peter Nichols took their first departure from the expected by casting them, not as themselves, but as fictional non-musicians. Here they are a troupe of movie stuntmen—albeit a troupe of stuntmen who, in a tradition honored all the way from Help to Spice World--all live together in a house set up with all manner of odd contraptions and eccentric contrivances. This means that Having a Wild Weekend is a pop music movie in which the featured pop artists do not actually perform their songs onscreen (although various DC5 songs do appear on the soundtrack.) This is a pretty bold move, though, when you consider the film as a whole, it’s not surprising that its makers would buck at making it the feature-length commercial that so many of these pop films were. As the film begins, we are introduced to Dave Clark in the role of Steve, as well as his four stunt man compatriots, who are played by band members Mike Smith, Lenny Davidson, Rick Huxley, and Dennis Payton. Somehow the group has gotten themselves embroiled in an ad campaign for the “Meat Promotion Council” that prominently features a fresh faced young model named Dinah (Barbara Ferris of Children of the Damned). 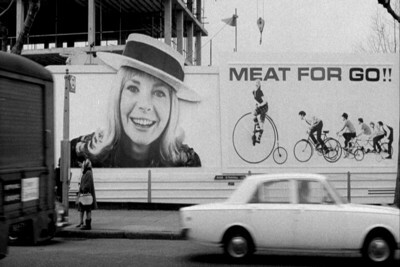 An opening montage shows us that Dinah’s gigantic, smiling visage, plastered on billboards alongside the slogan “MEAT FOR GO!”, has become an inescapable part of London’s urban landscape. A note on nomenclature: Dave Clark was the band’s drummer, as well as its producer and manager. He was also, to some extent, its visual focus—which given his matinee idol looks, is not surprising. Those looks also well suit him to be the film’s lead, as does his apparent grasp of the craft of acting. 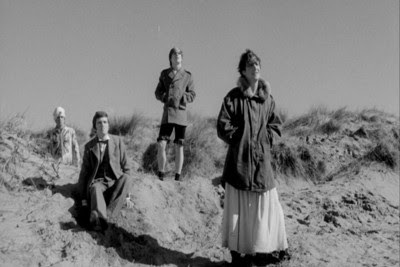 That said, whether it was direction or temperament that lead him to be so broody and intense throughout the film is anybody’s guess, although it is definitely out of character with the good time vibe of his band’s music. Perhaps it was just that all of Ferris’s toothy beaming was enough for both of them. In any case, when we join Steve on the set of the latest “Meat for Go” TV commercial, it is clear that he is already fed up with the whole business. 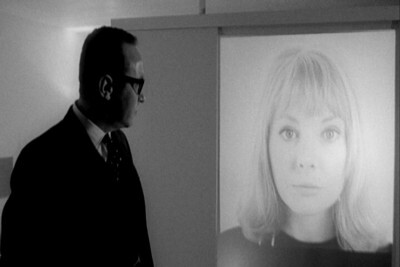 Dinah, weary of being seen as “that butcher girl”, reveals that she, also, longs for escape. 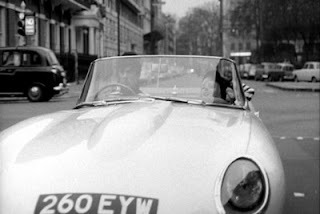 The only thing for it is for the two to “borrow” a Jaguar E-Type from the studio lot and head out on a freewheeling journey. When Dinah tells Steve of a deserted island just off the cost she dreams of buying (“An island all to yourself”, Steve muses with a distant look in his eye), he vows to take her there. 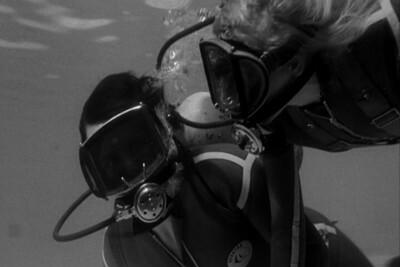 Thus begins a journey that Boorman—having fulfilled his commercial obligation by insuring that the producers could list the Dave Clark Five on the film’s poster—feels free to depict in a loose, episodic and occasionally digressive style, at times making room for things that he probably just thought would look cool, like a scuba diving sequence that showcases some nice underwater camera work. 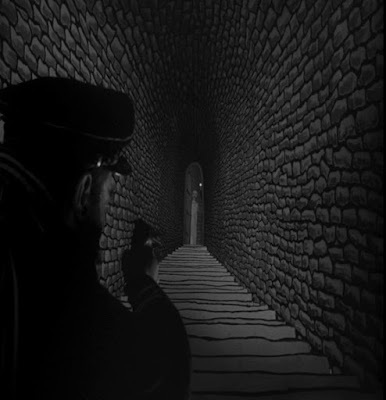 Once on their journey, Steve and Dinah pass through three “stations” that seem to be of particular significance, seeing as each represents a potential escape route that turns out to be a dead end. In the first instance, fate—or Boorman’s eye for expressionistic desolation—leads the two to a bombed-out village inhabited by a tribe of hippy squatters who ask them if they have any “spliffs” or “horse” (they don’t). The catastrophically burnt-out leader of the group then regales them with a grizzly retelling of the legend of King Solomon before they are all chased off by mortar fire from an army unit that is using the ruin for maneuvers. 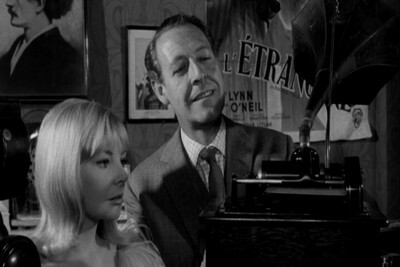 The two then hitch up with a middle aged couple of wealthy idlers, Nan (Yootha Joyce) and Guy (Robin Bailey). These two represent themselves at first as open minded free spirits, but turn out to be trapped in a loveless marriage—him lost in a nostalgia expressed through a collection of classic film ephemera and old victrolas—that leads each in turn to make unwanted advances upon their young guests. This is followed by a brief idyll at a horse ranch owned by an acquaintance of Steve’s, which provides the opportunity for lots of blatantly symbolic shots of horses running free before the youngsters are run off by encroaching forces that I will discourse upon below. Having a Wild Weekend’s title raises expectations of a carefree romp, which the film itself then confounds in two key ways. 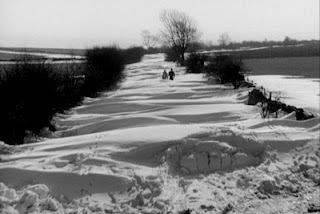 One is the placement of all of its action in the dead of the English winter, which renders its monochrome portrait of grey urban and barren rural locations all the more bleak. More importantly is its focus on the sullen-faced Clark at the expense of the other DC5 members, who provide sporadic one-liners and sight gags on those rare occasions that they appear on screen. I think the idea was to position Clark as an angry young man--a Mod-era Holden Caulfield, even--railing against the phoniness of modern life while being lost as to what should take its place. It should also be said that Having a Wild Weekend’s—if you’ll pardon the pun—“beef” with modern consumer capitalism is a sincere one. Interestingly, Steve and Dinah’s first act upon making their escape is to vandalize Dinah’s billboards with graffiti and cans of black paint. From that point, we see the city through their eyes: as something alien—to the point that the omnipresence of Dinah’s giant, grinning face, alongside that grotesque slogan, becomes downright dystopian, the smile seeming more and more like an agonized rictus. 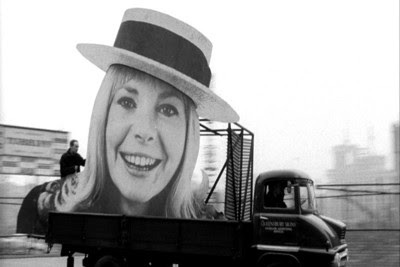 When, later, Dinah takes up a bullhorn and starts haranguing passers-by (from the back of a Jaguar E-Type, mind you), it’s easy to imagine her shouting Situationist slogans. After all, what is these two malcontents’ journey if not a dérive, a re-contextualizing of experience with the distorting lens of consumer culture removed? Perhaps that last statement is a little hard to swallow. Nonetheless, evidence of Having a Wild Weekend’s desire to be a French film ranges from the philosophical to the stereotypical, with an example of the latter being the striped shirt and beret ensembles that both Clark and Ferris wear for a good chunk of the picture. 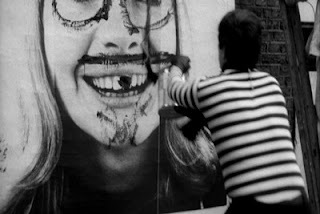 Influence of the New Wave abounds, with Breathless in particular being a frequent visual referent. Even its depiction of “no business as usual” defiance seems to presage the spirit of the 1968 Paris Revolt. A shrewd businessman, Dave Clark sat on his band’s catalog for a number of years until he could command top dollar for it. It is a good thing that it is now available for all of us to enjoy, because his band’s upbeat music is the perfect antidote to this very downbeat film—which I wholeheartedly recommend nonetheless. Today: It's all happening at the library! 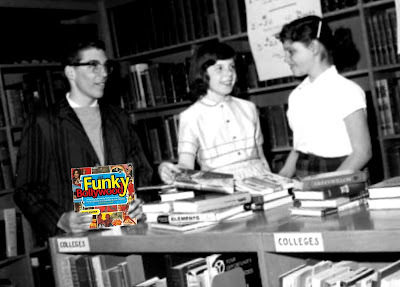 What kind of man reads Funky Bollywood? Hey, do you live in San Francisco and enjoy hanging out at the library on weekday afternoons--and not just because of the clean bathrooms, but also because of the myriad learning opportunities that present themselves? If so, boy are you in luck. 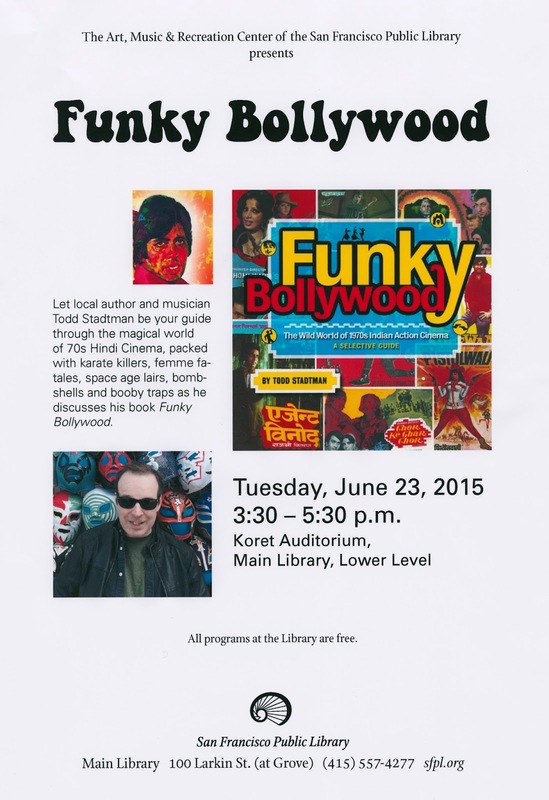 Because I'm going to be at the San Francisco Public Library's main branch this very afternoon, discussing my book Funky Bollywood: The Wild World of 1970s Indian Action Cinema with Arts Librarian Moazzam Sheikh, who is himself no slouch in the area of Bollywood knowledge. This event is totally FREE and starts at 3:30 pm in the Koret Auditorium, which is located on the library's lower level. The library itself is located at 100 Larkin Street, at Grove, across Civic Center Plaza from City Hall. BEEEE THEERRREE! Do you live in the San Francisco area? 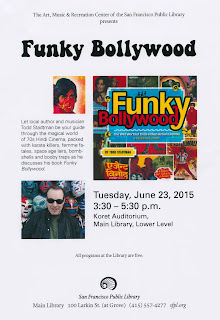 Well, here's an idea: why not play hooky from work on Tuesday and come down to the SF Public Library's main branch, where I will be appearing in conversation with Arts Librarian Moazzam Sheikh--no slouch on the subject of Indian cinema himself--on the topic of all things Funky Bollywood. The event will be taking place in the Koret Auditorium, which is located on the library's lower lever, and runs from 3:30 to 5:30pm. The more highbrow among you might frown upon the notion of such a monument to literacy and learning as the SFPL hosting an event like this, but clearly the folks there recognize my book Funky Bollywood as a gateway to the classics. Come on down. You might learn something. 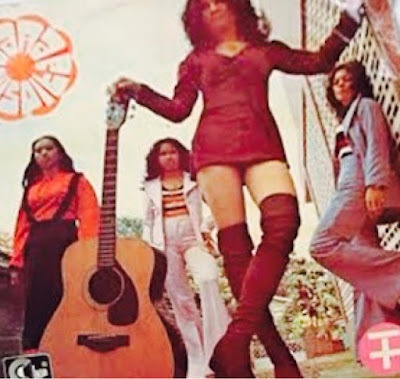 If you listened to Wednesday's all-girl episode of Pop Offensive, you know that proximity to all that raw feminine charisma left the men of Pop Offensive somewhat addled. For starters, Jeff made a dramatic late entrance, grasping the mike away from a young pretender to his throne. And yours truly, still recovering from my whirlwind trip to Southern California, found himself unable to hold up to Jeff's usual torrent of cryptic exclamations and non sequiturs. 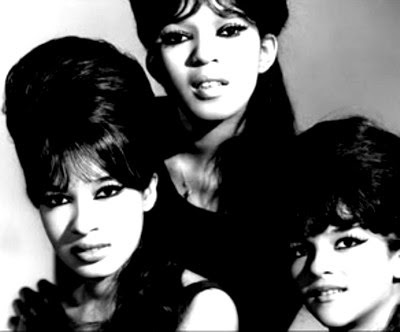 Still, we were able to hold things together enough to deliver up an exquisite selection of sounds, combining acts as diverse as the Ronettes, the Runaways, Francoise Hardy, and the Belle Stars into one united chorus of estrogen enriched awesomeness. If you missed it, your in luck; because the podcast version has just been posted over at the Pop Offensive archives. The complete playlist for the episode is also available on the Pop Offensive Facebook page. By the way, this last marks the end of our experiment in bi-monthly episodes, at least for the time being. If you want it to be otherwise, it might help if you let us know how much you missed us when we come back. Tonight, Pop Offensive ups the estrogen levels with its first all-girl extravaganza. Be sure not to miss what is likely to be our best episode yet. You can either stream it live from the 9th Floor Radio website starting at 7pm PT, or download it later from the Pop Offensive archives. Tweet us to tell us how much you love us at @PopOffRadio. Last Saturday's Funky Bollywood event at San Diego's Digital Gym Cinema was all kinds of swell. What started out as a simple Q & A session between me and my esteemed fellow MOSS-er Miguel Rodriguez quickly evolved into a lively discussion involving most of a very engaged audience, many of whom contributed interesting and informative comments of their own. If you wish you had been there, you're in luck--because Miguel has just posted the audio recording of the event as the latest episode of his Horrible Imaginings podcast (formerly known as Monster Island Resort). You can listen to it here. On this week's Pop Offensive: Girls! Girls! Girls! "Girls can't rock", once opined a budding philosopher, mere moments before having a spiked heel launched decisively into his groin area. These days, that the opposite of that statement is the case is so obvious that to offer proof of same would be superfluous. Yet, Jeff Heyman and I, being as much fans of clueless redundancy as we are of female music artists, propose to do just that. Join us this Wednesday, July 17th, as we treat you to a "no boys allowed" set brimming with girl groups, girl bands, ye ye girls, Japanese idols, soul divas, new wave vixens, and female singer-songwriters who defy the waifish stereotype. It all starts at 7pm PT, streaming live from 9thfloorradio.com. As always, Ladies are admitted free. 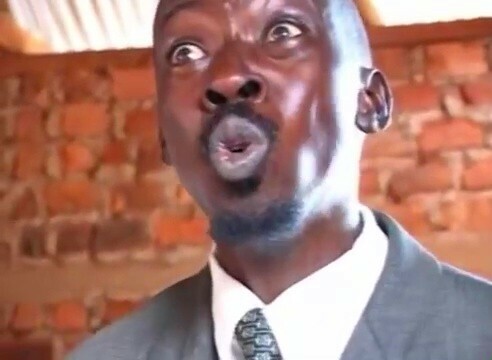 Due to the amount of Internet buzz already surrounding Ugandan zero-budget action director Isaac Nabwana (aka Nabwana I.G.G. ), I was tempted to avoid writing about him altogether. 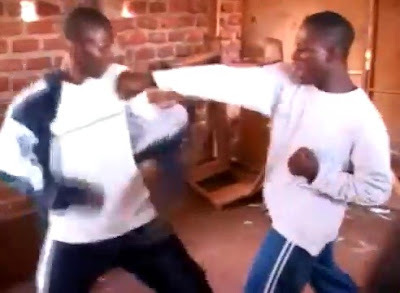 I eventually caved, though, because it became clear to me that I will likely be writing about Nabwana for many years to come and with growing frequency. With the increasing accessibility of digital technology making it easier than ever for filmmakers of even the most limited means and abilities to produce a professional quality product, it now falls to the poorest of nations to provide the scrappy, seat-of-the-pants style filmmaking that fans of B and pulp cinema thrive upon. 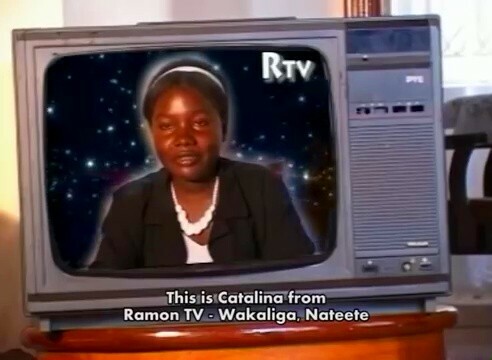 Thus has Africa become the last refuge of true cult cinema, with Nabwana's Ramon Studios, located in the Ugandan slum of Wakaliga, enthusiastically leading the charge. Of course, the nascent film industries of both Nigeria and Ghana have also pumped their share of trashy genre films into the market. But what Nabwana brings to the table is ambition of a level so inverse to his means as to seem heroic. Symptomatic of this is his dedication to the action genre, where conspicuous consumption is the rule of the day. Faced with the need for greater and greater explosions--a circumstance that would send other filmmakers to their backers with cap in hand--Nabwana instead sees an opportunity to explore even further the limits of some very primitive computer graphics software. Nabwana’s Who Killed Captain Alex, shot in 2010 for a budget of roughly $200, has become something of a flagship for “Wakaliwood” cinema, owing both to its success at home and it becoming a viral sensation upon its release to YouTube this past April. 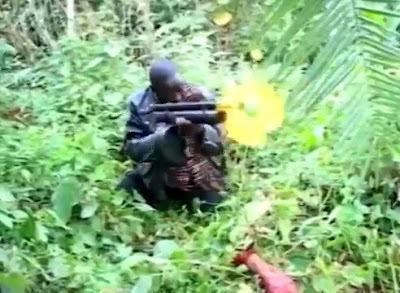 It concerns a Ugandan Special Forces unit—lead by Kakule Wilson as the titular Captain Alex , “Uganda’s best soldier”—who sets up camp in Wakaliga with the goal of eliminating the Tiger Mafia, a paramilitary style drug gang lead by crazy-eyed crime lord Richard (Sserunya Ernest). 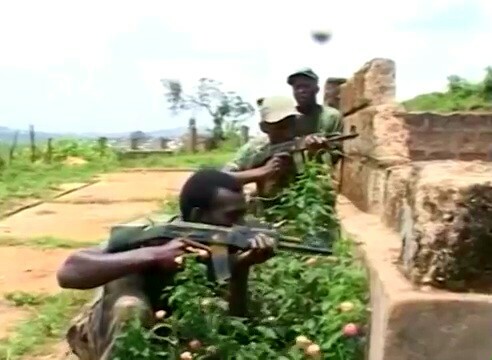 When a jungle skirmish between the crooks and commandos leads to Alex and his men taking Richard’s brother prisoner, Richard sends his minions forth to kidnap Alex. Before this can be accomplished, however, Alex is mysteriously murdered in his bed, leading to both the gang and the soldiers launching separate investigations into the crime—albeit for very different reasons. As action movie plots go, the idea of having two opposing sides doing battle while at the same time trying to solve the same crime is a fairly novel one. 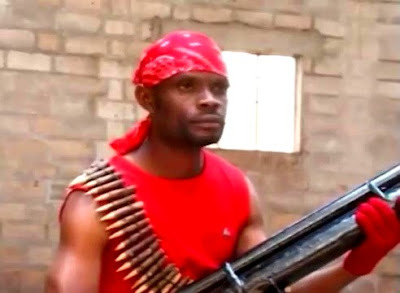 But the real novelty of Who Killed Captain Alex is in its inclusion of “audio joker” VJ Emmie, who provides loud offscreen commentary throughout the film, like a kind of cinematic hype man (just think of the shouty narrator from the trailer for the Ghanaian movie 2016 and imagine him doing that for an entire film). This ranges from excited exhortations (“Action! Action!”, “Expect the unexpectable!”), to helpful reminders (“you are watching Who Killed Captain Alex”), to pointing out changes of scene, (“Back at the Tiger Mafia base…”), to fart noises, to MST3K-style jokes at the film’s expense. This last serves a couple of purposes. For one, it deflects mockery of the film by beating potential hecklers to the punchline. But it also gives us some idea of what watching Who Killed Captain Alex with a Ugandan audience might be like—and clues us in to the fact that the intended audience for these films might not take them as seriously as some of us might assume they do. This further serves as snark-repellent--because what fun is there in condescending to a B movie without the assumed existence of a gullible audience who takes it completely in earnest? 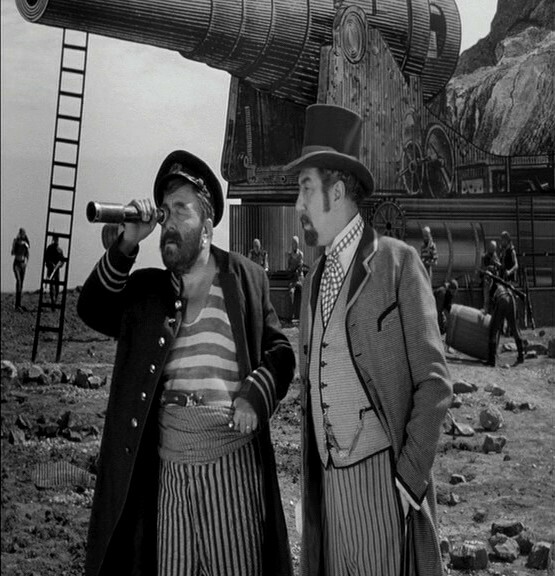 Indeed, it may be those who regard a film like Captain Alex with a kind of “WTF” incredulity who are the real rubes. VJ Emmie’s excited commentary often gives expression to national pride, informing us that Captain Alex is “Uganda’s first non-stop action movie” and at times just yelling “UGANDA!”. 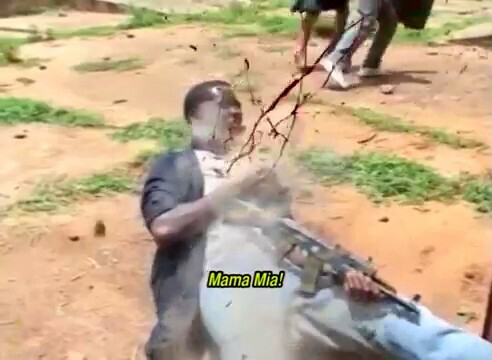 In a scene where a woman is being tortured by the Tiger Mafia, he jokes that she was “caught watching Nollywood movies” (and, indeed, I’m sure there are some who would choose torture over watching 666 (Beware the End is at Hand).) 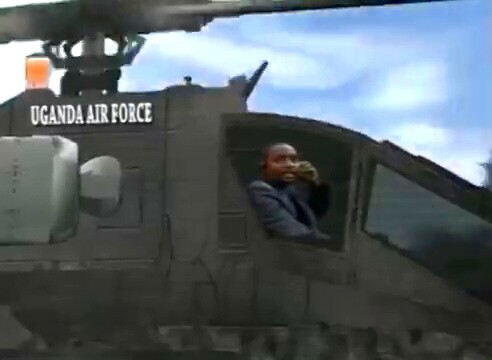 And, true to his word, there is cause for pride here: The admittedly risible sight of two ColecoVision helicopters doing battle over Kampala becomes indescribably thrilling when watched with the knowledge that Nabwana composed those effect on computers that he built himself from junk components. Yet before we can be dazzled by such spectacle—and in the name of “non-stop action”—new combatants must be introduced. 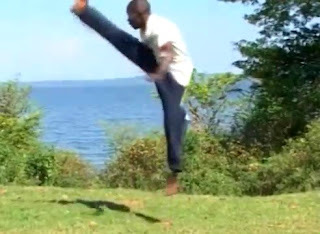 The first of these is Captain Alex’s brother, described as the “Ugandan Bruce Lee” or “Bruce U”, who comes to Wakaliga and asks to be included in the investigation of his brother’s death. The second is the unit’s new commander, who also proves to be no slouch in the kung fu department. Wakaliga being something of a hub of kung fu enthusiasm in Uganda, both of these men prove to have some legitimate skills—and Nabwana films their fights with a commendable eye toward legibility and visible cause and effect. One could easily think of a few vastly better paid Hollywood action auteurs who could learn from him. Captain Alex ends with a prolonged pitched battle between both forces that is rife with CG blood spray and explosions. This was reportedly filmed in one two hour shoot that took place on the eve of the film’s release in Uganda. Despite the gory fx, the reckless enthusiasm and barely concealed joy of the participants gives it the feel of a backyard game of "war" played by a bunch of sugar-amped pre-teens. 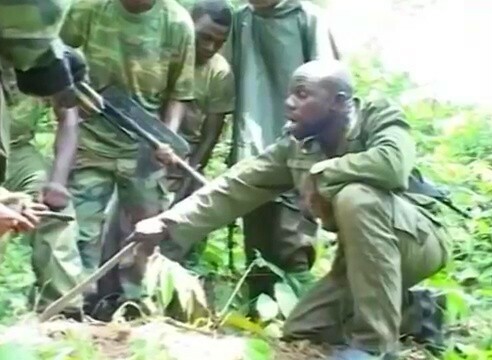 Of course, I mean that as a compliment; the exultant love of filmmaking that is apparent throughout Who Killed Captain Alex is nothing if not infectious. By the time it’s over, we don’t even care that no one has bothered to solve its titular mystery. 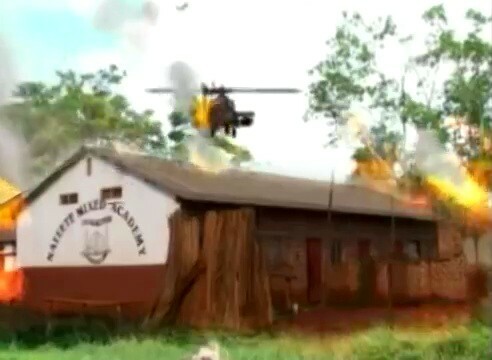 Of course, Who Killed Captain Alex bears some similarities to genre films coming out of Nigeria and Ghana—the shot-on-video look, the crude effects, the amateur actors. Yet Nabwana clearly intends for his work to be more than just a tributary into the larger body of African action cinema, as there are also some shrewd differences. 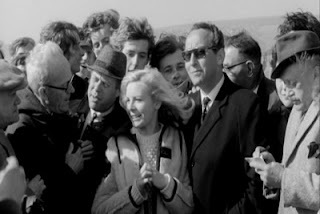 The film boasts a brisk running time that contrasts pleasingly with the three hour-plus gab fests of woods Nolly and Golly, while being refreshingly free of those films’ Christian evangelicism. 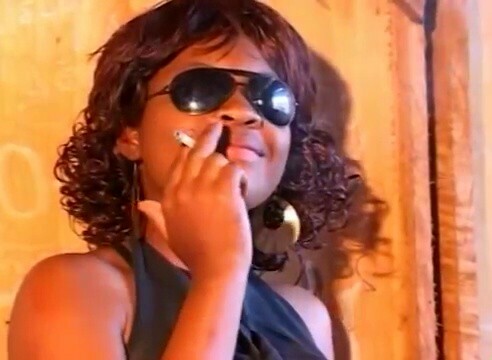 Nabwana also exhibits a wily understanding of social media and internet marketing (not to mention a brand savvy self-awareness resemblant of The Asylum and Troma), and clearly has an eye toward the Western market. Indeed, I think it can be said that, with Captain Alex, Nabwana is forcing African genre cinema toward the next step in its evolution. From where I’m standing, the transition will be one that is very exciting to behold.